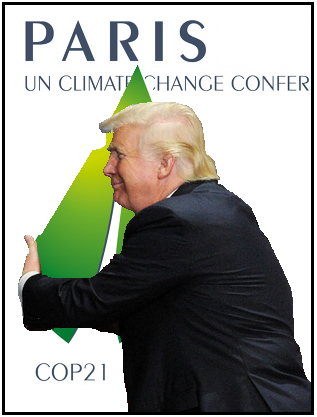 Upholding the Paris Climate Agreement makes good political sense. Trump's calculus is unlikely to factor the urgency of reducing carbon pollution to avert a climate catastrophe but he may embrace the deal as a matter of self interest. Both the Washington Post and The New York Times recently reported that the momentum has turned against the Paris climate agreement in the Trump White House. However, adhering to the deal makes political sense for the president in the context of the constitutional crisis he has created by firing FBI Director James Comey. The Trump administration has delayed its decision on whether to withdraw from the Paris Climate Agreement until after the G7 meeting at the end of May. Trump and the GOP have amassed a litany of anti-environment initiatives in their first 100 days. In this context withdrawing from the Paris Deal would be consistent, it would also honor a pledge made by Trump on the campaign trail. However, Trump lies, so if he were to break this promise it would hardly be out of character particularly when you consider the possible political gains. There are some compelling reasons why Trump and the Republicans might want to reconsider abandoning Paris. Given Trump's self-serving compulsion and his propensity to put himself before country or party, adhering to the Paris Agreement would deliver important political benefits at a crucial time. In the context of the constitutional crisis, Trump created it makes sense strategically to divert attention away from the investigation into his team's collusion with Russia. With Trump's popularity plunging through the floor staying with the deal might also give him a boost. The agreement enjoys the support of 71 percent of Americans, including 57 percent of Republicans. If Trump read books he might be inclined to read up on the politics behind the creation of the Environmental Protection Agency (EPA). Richard Nixon created the EPA in part to help siphon off some of the pressure that was coming from protestors. A range of interests have urged Trump to stay with the agreement. Very early on heads of state, climate scientists and business leaders all warned Trump not to cancel the Paris Agreement. Investors are concerned about the risk posed by Trump. Corporate America is increasingly affirming their support for the agreement. Even the fossil fuel industry is dropping its resistance this includes companies like Exxon Mobil, BP and Shell. A ThinkProgress article by Joe Romm shares the view that Trump needs the accord in the wake of the firing of FBI director James Comey. As explained by Romm, staying with the deal helps to legitimize an increasingly illegitimate administration. "Every president in the modern era who gets into trouble at home, looks to opportunities to engage other leaders on the world stage publicly and cooperatively to demonstrate their legitimacy," explained Andrew Light, senior fellow at World Resources Institute and former U.S. State Department climate official. Walking away from the deal will make the US into a "rogue nation, a global pariah like Putin’s Russia," Romm said and this will make it impossible for the Trump administration to work with foreign governments. There has even been talk of imposing a carbon tax on the US. Perhaps most importantly from Trump's point of view, an exit could seriously hurt his brand. "Trump will soon learn that to achieve any foreign-policy triumphs to counterbalance his domestic troubles, he will have to stay in Paris. And while Trump is notoriously a bad listener, he does understand the value of trying to preserve one’s brand, especially after it gets damaged," Romm said. 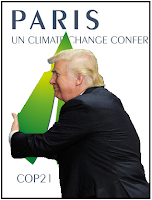 Honoring the Paris Agreement is smart politics however, there is a caveat, this administration is anything but smart.